New study reports significant growth in economic impact. The Port of Long Beach is connected to one in five jobs in Long Beach, sustaining a local workforce that continues to drive economic growth across the region, according to a new Economic Impact Study prepared for the Port and presented Monday to the Long Beach Board of Harbor Commissioners. 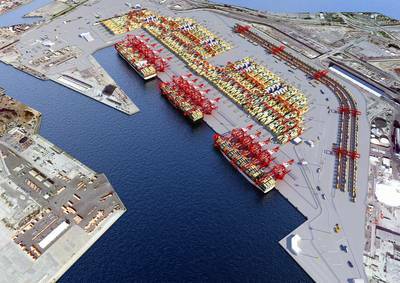 As the nation’s second-busiest container seaport, activity at the Port supports 51,090 jobs in Long Beach alone, according to the Economic Impact Study completed by EDR Group Inc. In the five-county region, more than 575,000 jobs result from Port trade, construction and tourism, and the number grows to 2.6 million nationwide. Across Southern California, the Port supports 576,350 jobs, providing $30.8 billion in income. Statewide, 705,430 jobs are supported by the Port, providing $38.7 billion in income. The Port supports about 2.6 million jobs in the United States, providing $126.8 billion in income. Port-related jobs across the city have increased by 70 percent since the previous economic impact study, completed in 2004, mainly due to increased cargo volume. The earlier study showed that the Port was connected to 30,000 jobs -- about one in eight -- in Long Beach. On a wider scale, the previous report stated that the Port supported more than 300,000 jobs in the five-county region -- Los Angeles, Orange, San Bernardino, Riverside and Ventura -- and 1.4 million jobs in the United States. The Port of Long Beach is one of the world’s premier seaports, a gateway for trans¬-Pacific trade and a trailblazer in goods movement and environmental stewardship. With 175 shipping lines connecting Long Beach to 217 seaports, the Port handles $194 billion in trade annually, supporting more than 575,000 Southern California jobs.